For years, when my wife asked me what I wanted for my birthday or Christmas, I would jokingly say, "The first or fourth edition of Johnson's Dictionary." She never came through, and I don't know why - those editions only cost around $10,000 U.S. Over the years I've toyed with buying a facsimile edition or a CD-ROM edition, but even those are priced in the hundreds of dollars. But lo and behold, there is now a cheap Kindle version. And while it's not perfect, I'm pretty thrilled to be able to carry Johnson's Dictionary around with me. The Kindle version is based on the fourth edition, the last edition to which Johnson made significant additions and corrections. But when an entry appeared only in the first edition, it's also included. 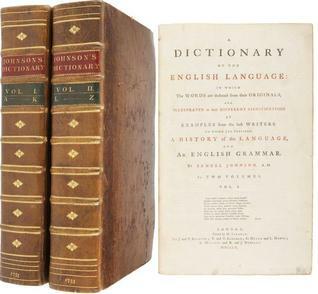 Johnson' Dictionary is more than just a book; it's a monument in the history of English literature. Warts and all, it was the standard English dictionary for at least a hundred years. As Henry Hitchings points out in his book about the Dictionary, Johnson's use of quotes to illustrate the meanings of words makes the Dictionary an anthology of English writing up to Johnson's time. Johnson's definitions range from on-point to humorous to off-base to just odd, but the passages he chooses to quote are fascinating. Up to now I've only had access to selections from Johnson's Dictionary, and didn't realize that there were so many illustrative passages - the quotes take up much more room than the definitions.I've marked this as "read," which, of course, is just ridiculous; I just didn't want it to show in my "currently reading" list for the rest of my life. Although a few notable figures (like Nathaniel Hawthorne) read it from cover to cover, this is a book to skip around and get lost in. I'll find myself curious about what Johnson has to say about a certain word, but before I get to that word, I'll get sidetracked a dozen times.My rating of four, rather than five stars is a reflection of the weaknesses of the Kindle edition. The line breaks in the quotations are sometimes weird, but it's not really too hard to figure out what was intended. And navigation is not as awkward as you might expect in a work like this, but it's still not always easy, depending on what word you want to look up. There are many "jumping off" points marked in the table of contents, but if you pick a word halfway between two of those points, you may have a lot of scrolling to do.It's amazing to think that this mammoth achievement was the work of one man. It's flawed, incomplete, and dated, but still amazing. Another one that I'm using as a nightstand right now! It's fantastically heavy and immense; the facsimile edition is about 22 inches by 12 inches and 6 inches deep! Don't misunderstand; it's just as fun to peruse too, and eventually, I would love to read through the entire tome. Johnson's definitions are interlaced with a wry wit and humor that spices up an otherwise dull peek into the history of the English language. It also proves to be a wealth of quotations, as Johnson provides examples from the leading literature of his time and earlier to support his definitions. The complete facsimile edition is as hard to find as Lord Chesterfield's Letters or The Wrecker but definitely worth it and far more satisfying than the recent abridged versions. I just read Johnson's preface to his Dictionary (in the Harvard Classics, 1st edition, a gift of my wonderful wife). When you think about his having created a dictionary BY HIMSELF, the magnitude of the accomplishment overwhelms. His Preface describes his method. Here is truly one of the great intellects of all time. Samuel Johnson - Samuel Johnson was an English author. Beginning as a Grub Street journalist, he made lasting contributions to English literature as a poet, essayist, moralist, novelist, literary critic, biographer, editor and lexicographer. Johnson has been described as "arguably the most distinguished man of letters in English history". He is also the subject of one of the most celebrated biographies in English, James Boswell's Life of Samuel Johnson. Boswell's Life, along with other biographies, documented Johnson's behaviour and mannerisms in such detail that they have informed the posthumous diagnosis of Tourette syndrome (TS), a condition unknown to 18th-century physicians. He presented a tall and robust figure, but his odd gestures and tics were confusing to some on their first encounter with him.Johnson was born in Lichfield, Staffordshire, and attended Pembroke College, Oxford for a year, before his lack of funds forced him to leave. After working as a teacher he moved to London, where he began to write essays for The Gentleman's Magazine. His early works include the biography The Life of Richard Savage and the poem "The Vanity of Human Wishes." Johnson was a devout and compassionate man, whose Christian morality permeated his works. Although he was a conservative Anglican, he respected those of other denominations who demonstrated a commitment to Christ's teachings.After nine years of work, his Dictionary of the English Language was published in 1755, bringing him popularity and success; until the completion of the Oxford English Dictionary, 150 years later, Johnson's was viewed as the preeminent British dictionary. In the following years, he published essays, an influential annotated edition of William Shakespeare's plays, and the well-read novel Rasselas. In 1763, he befriended James Boswell, with whom he later travelled to Scotland; Johnson's travel narrative A Journey to the Western Islands of Scotland described the journey. Towards the end of his life, he produced the massive and influential Lives of the Most Eminent English Poets, which includes biographies and evaluations of 17th- and 18th-century poets. After a series of illnesses, Johnson died on the evening of 13 December 1784; he was buried in Westminster Abbey. In the years following his death, Johnson began to be recognised as having had a lasting effect on literary criticism, and even as the only great critic of English literature.